Boyds, Md. 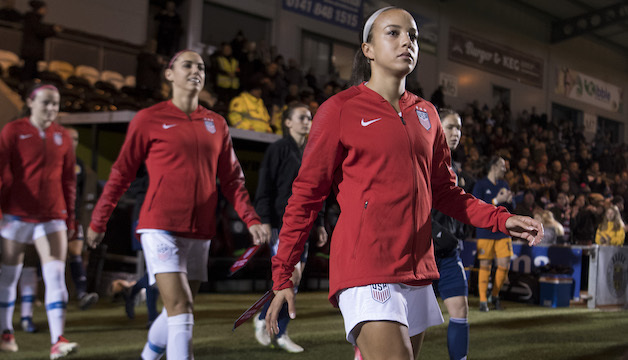 (Jan. 19, 2019) – Washington Spirit midfielders Rose Lavelle and Andi Sullivan, and forward Mallory Pugh will aim to help the top-ranked U.S. Women’s National Team open 2019 with a win over No. 3 France on Saturday at Stade Océane in La Havre, France (2:30 p.m. ET on FOX Sports 1 and UDN). In the last round of friendlies before the SheBelieves Cup, Lavelle, Sullivan, and Pugh will be looking to solidify their roles within Ellis’ roster before the upcoming SheBelieves Cup tournament next month, and the 2019 FIFA World Cup this summer. Lavelle has quickly become a consistent starter for head coach Jill Ellis, as she broke out during the 2018 CONCACAF Women’s Championship late last year. The Cincinnati native scored three goals, including the championship-deciding score against Canada in the title match. Lavelle will look to make her 21st appearance for the U.S. during their friendly against France, and add to her total of six goals. Pugh was also selected to travel with the US during the CONCACAF Women’s Championship, making four appearances. Pugh has 43 caps and 12 goals entering the World Cup year. Sullivan has 11 appearances for the U.S. senior team, earning her most recent cap during a historic 1-0 victory against Portugal, the USA’s 500th all-time win.